Huascarán National Park is a park that is made up predominantly of the Cordillera Blanca mountain range and covers a total area of 340,000 hectares. This mountain range is part of the Central Andes and and is the highest tropical mountain range in the world. In 1985 the park was made a World Heritage site by UNESCO. Travelers are attracted to Huascarán National Park from all over the world for its fantastic mountaineering, trekking and unique biodiversity. With almost 800 different types of plant species having been identified within the park, it is one of the most biodiverse habitats in South America. 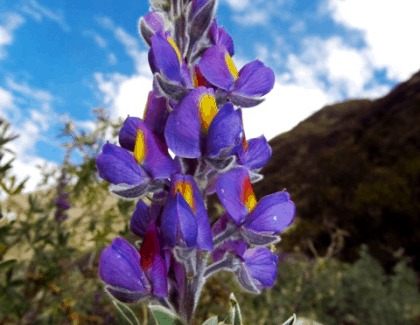 One of the most intriguing plants that grows in the Huascarán National Park is the Queen of the Andes. This is the largest species of bromeliad, growing up to 15 metres in height. The Queen of Andes is native to the high Andes of Bolivia and Peru. The park has an extremely wide array of animals living both harmoniously and in competition with each other within the one habitat. More than 120 bird species have been recorded in the park. These range from the Andean condor to the giant hummingbird. 11 mammal species have been recorded in the park, some of which are currently endangered. These include the white-tailed deer, the puma and the Andean fox. There are many activities for visitors of the park. These activities include hiking, mountain biking, skiing and trekking. Huascarán is any adrenaline junkie’s paradise with 25 trekking routes and over 100 mountaineering locations. For anyone interested in learning about the history of the park, there are 33 archaeological sites in the park that showcase the lives of previous inhabitants of this harsh landscape. These sites range from cave paintings to tombs and fortresses. The Santa Cruz trek in Huascarán National Park is one of the most popular treks in South America for international trekkers. This trek does not require a permit and can be tackled solo, without the aid of a guide, although it is recommended that you travel with a tour operator. The Santa Cruz trek usually takes between 3-4 days depending on the individual’s level of fitness. The beautiful trek is 50 km long and leads you right to the core of the mountains. Fascinating scenery along the trek includes vibrant turquoise lakes, stunning views of the cordillera peaks and red qeñua trees. 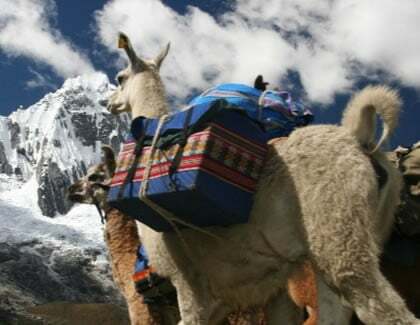 Both the Llanganuco Lakes and the Huayhuash Circuit are other options for trekkers who want to experience the natural beauty of the Huascarán National Park. The Llanganuco lakes trail takes approximately 6 hours and is one of the more iconic treks within the park. The two lakes are made up of the meltwater of the glaciers that stand each side of the lakes. This trail possesses breathtaking views that would impress even the most traveled of trekkers. If you’re looking for a longer trek, then you may want to undertake the Huauyhuash Circuit which takes from 8-10 days to complete. This trek has impressive scenery around every corner, including: turquoise lakes, thermal baths and a wide array of snow-capped peaks. Widely regarded as one of the most worthwhile long distance treks in the world! Whatever your exact interests, you’re sure to find something that excites you Huascaran national park. With such a range of treks and trails, there is enough variation in landscape and difficulty that everybody can enjoy this spectacular park.